This solution covers how to create a Learnosity-powered assessment product, driven by our embedded authoring APIs for Item & Activity creation. Have in-house and potentially teacher-created content. Have an in-house content management system with a need to extend that experience. A company, Initech, is a large education technology company with a platform that many teachers, students and administrators use. Teachers can create courses, assign homework and add grades within it. Students can access their classes and do their homework within the Initech platform. Add a powerful Item authoring experience to allow their users to create their own content. Add many more Technology Enhanced Items (TEIs) to their assessments. Embed a powerful assessment tool within their environment. Have a deep understanding of the data around their assessments. 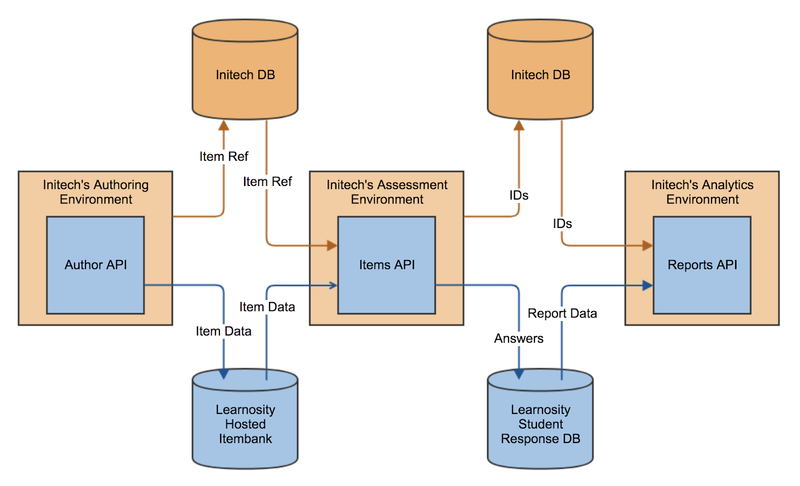 Figure 1: logical architecture diagram for Initech's assessment solution. Embeds an Item editing tool within Initech’s platform. Allows Initech to limit the teachers to only see what they themselves have created, or allows them to select from Initech’s entire Item bank. 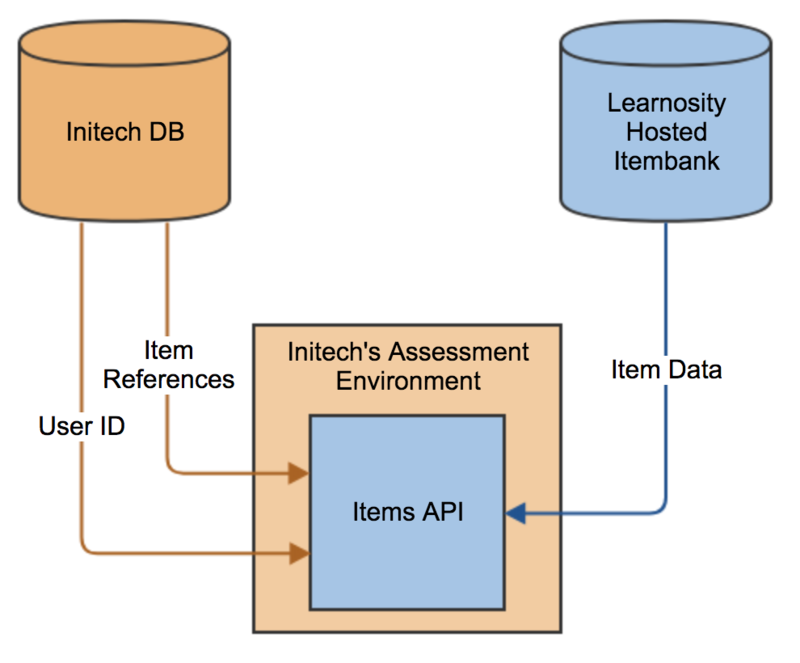 Embeds assessments in Initech’s platform using Learnosity’s assessment wrapper. Pulls down content from Initech’s Item bank, hosted on Learnosity’s servers. Has many assessment aids for the students to use, such as accessibility tools, review screens, and answer eliminators. Saves the students' work, and submits it to the Learnosity servers for scoring. Embeds reports designed for student and teachers within Initech’s platform. Calculates what information to show and puts the UI on the page. 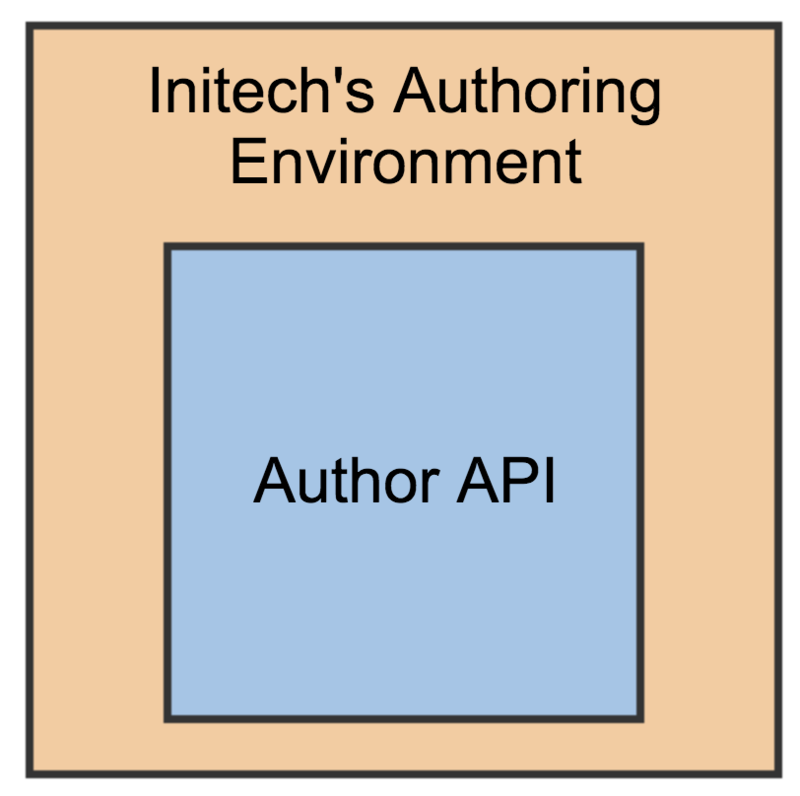 The first step for Initech is to embed the Author API wherever their teachers will need to create content. In their platform, after an instructor logs in, the user has the option of navigating to a page where they can manage their assessments. Here, the Author API is initialized, embedding it within the page. 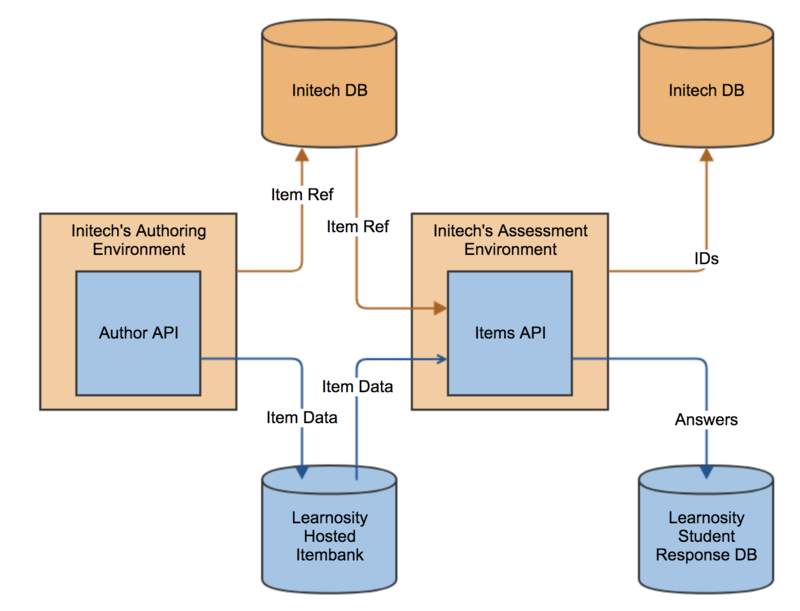 Initech can use the Author API’s Activity builder to allow the user to build tests from the Items in Initech’s Item bank, allow the user to make their own content, or even allow them to do both. The user never has to switch over to a new site or even know about Learnosity — they just assume these tools are built by Initech. Figure 2: embedding Author API. On initialization, Initech staff can hand some basic information to Learnosity’s Author API about how they want the embedded authoring solution to appear to this particular teacher. Learnosity also needs to know the user ID of this author, though it is one of Initech’s choosing, and contains no personal information whatsoever. 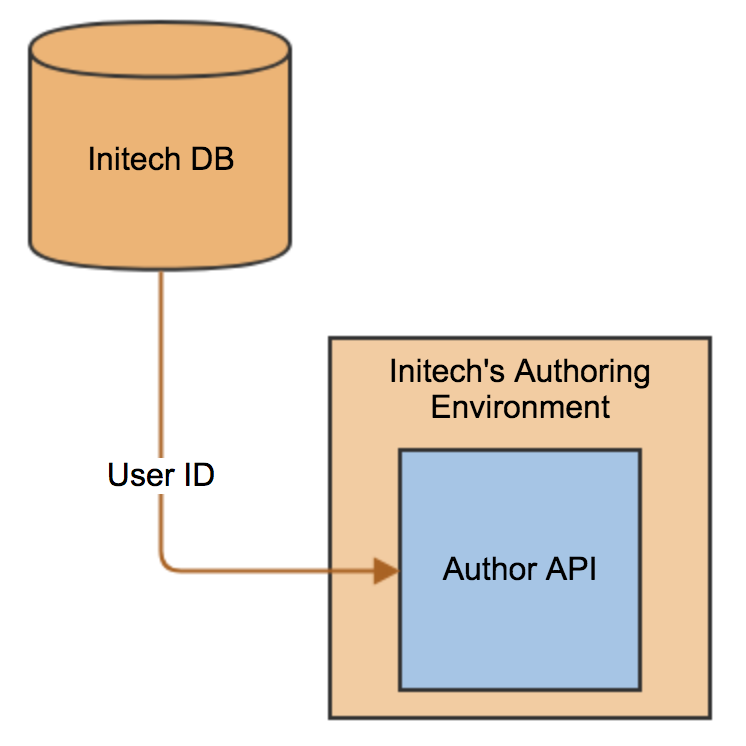 Figure 3: the Initech database provides the user ID to Author API. Once the initialization is complete, most of the heavy lifting is now done by Learnosity. The author can interact with the embedded authoring solution. Once they’ve built or edited their first Item and are satisfied, they hit "save". Figure 4: Items are saved to the Learnosity Item bank. At this point, all the Item data is sent to Learnosity’s database and saved to Initech’s Item bank. Rather than having to save all the Item JSON or media files themselves, Initech only has to save the Item’s reference, which they will use to identify it later when they want to put it in front of the student. With Items created and stored in the Initech Item bank, they can now be presented to students as assessments. Just like the teachers, they will log on and have a way to navigate to an assessment part of the platform. Once they’ve selected which test they’d like to take, they are brought to a page where the Items API is initialized. Initech is going to use the assess wrapper to give their students access to Learnosity’s assessment aids. Figure 5: embedding Items API. Just as with Author API, Initech will need a user ID so they can get the student’s information later. Just as before, absolutely no personally identifying information is used. They'll also need to pass all those Item IDs we saved before — along with instructions for the Items API on how to appear for this student. This will automatically pull down all the relevant information around the authored Items in Initech’s Item bank. Each of these Items is rendered within the assess wrapper, allowing the student to go through the content at their own speed. 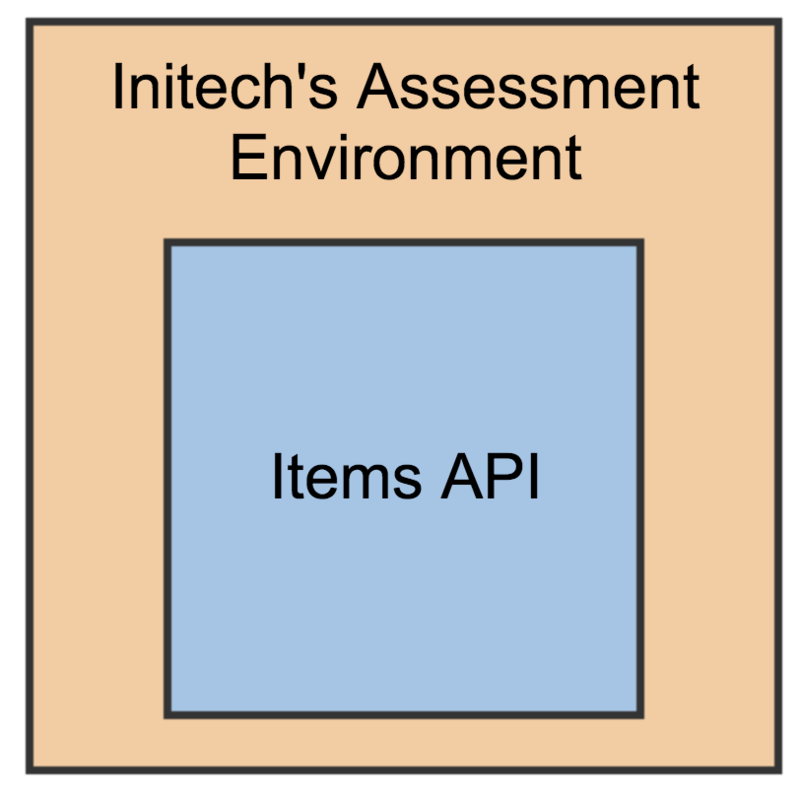 Figure 6: the Initech database provides the user ID and Item references to Items API. As before, now that we’ve initialized the API, Learnosity can do most of the heavy lifting. As the student interacts with their Activity, they can save their work or submit it for final grading. Both of these processes are handled entirely by Learnosity. The only thing Initech has to do is note that the student has completed the Activity, and so they should save the session and Activity IDs for reporting. Initech will use the session ID to identify this particular instance of this student taking the Activity, while they will use the Activity ID as a way of identifying all the instances between all the students who have taken this Activity. Using a combination of these three IDs, they can easily get any set of data they need. Figure 7: student answers are stored in the Learnosity student response database. Let’s recap what’s been created so far. 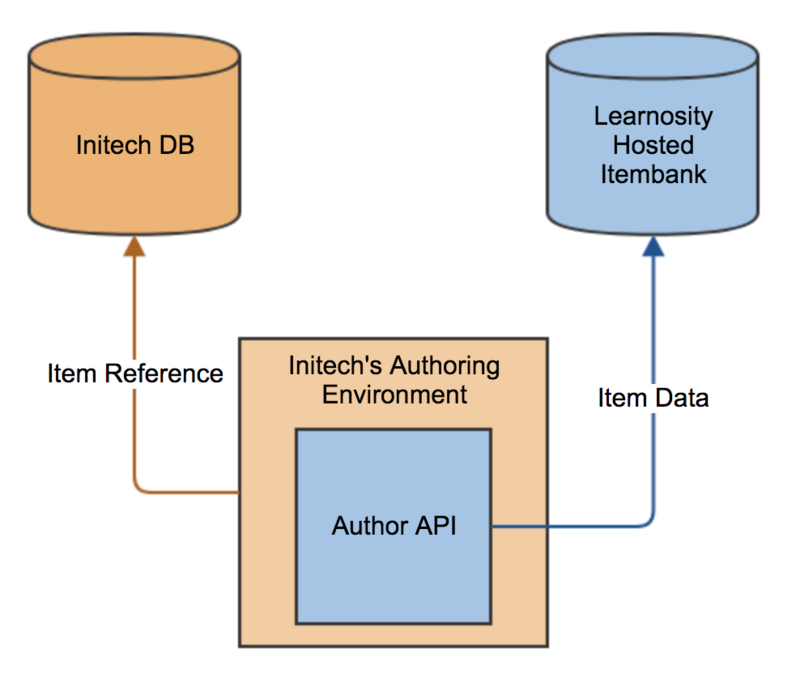 Initech has added Learnosity’s Author API to their authoring environment, letting Learnosity handle and store all the authored Items. Initech just has to store the Item IDs on their side. Then, when it’s time to show Items to students, they just need to pass a few relevant IDs from their side along with the Item IDs for Learnosity to render the assessment experience. Figure 8: Initech's solution showing authoring and assessment phases. Finally, Initech has to think about analytics. 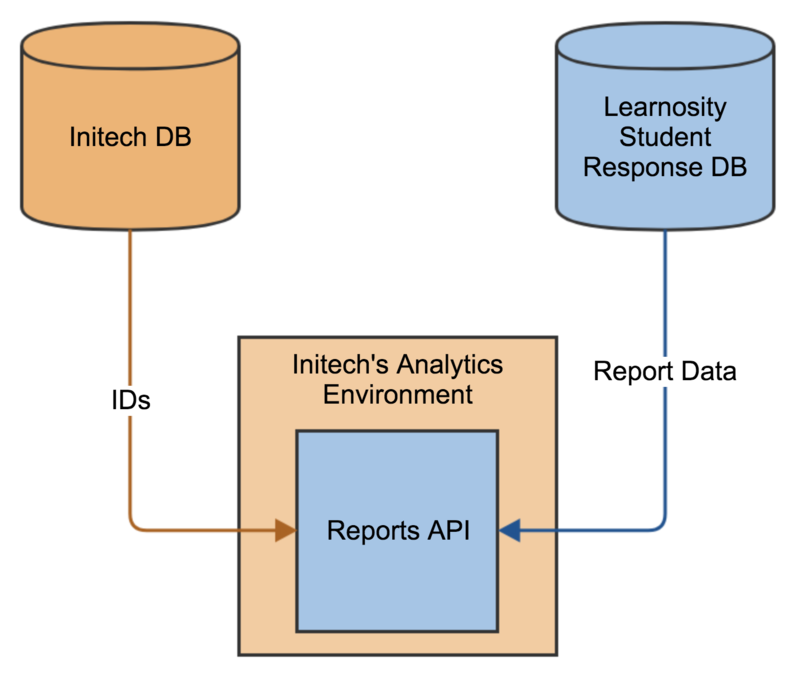 Initech is going to start with Learnosity’s Reports API. 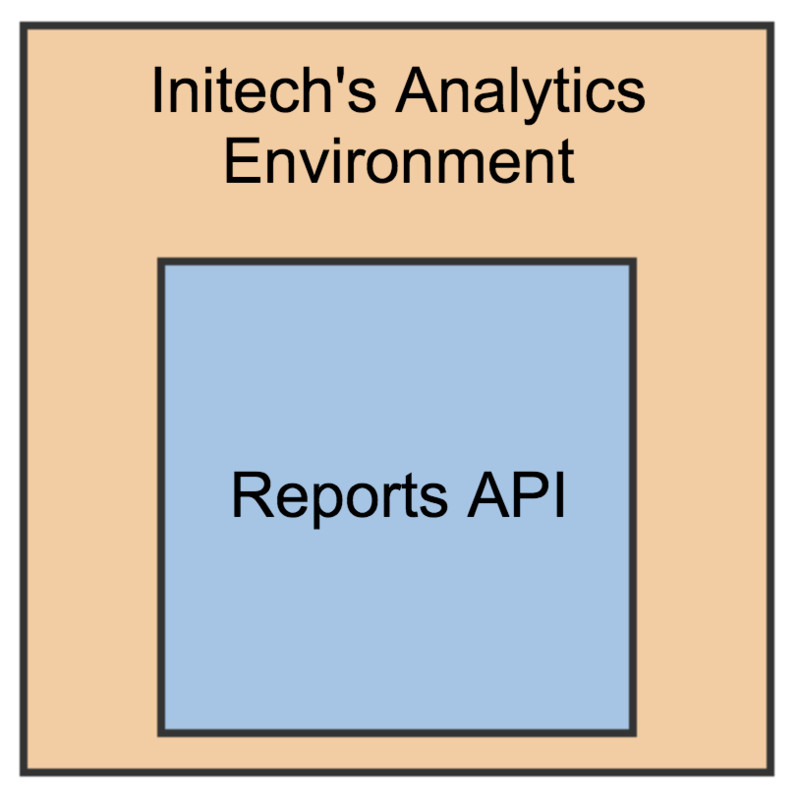 Like the Author API and the Items API, the Reports API will render Learnosity reports right in Initech’s environment. Once a user has navigated to the right place in Initech’s platform, the Reports API can be used to render reports on the page. Figure 9: embedding Reports API. The IDs Initech saved from the last step, during the assessment experience, can now be passed to the Reports API. The user ID can be used to get reports on individual students, while the session and Activity IDs identify different sets of Activities taken. 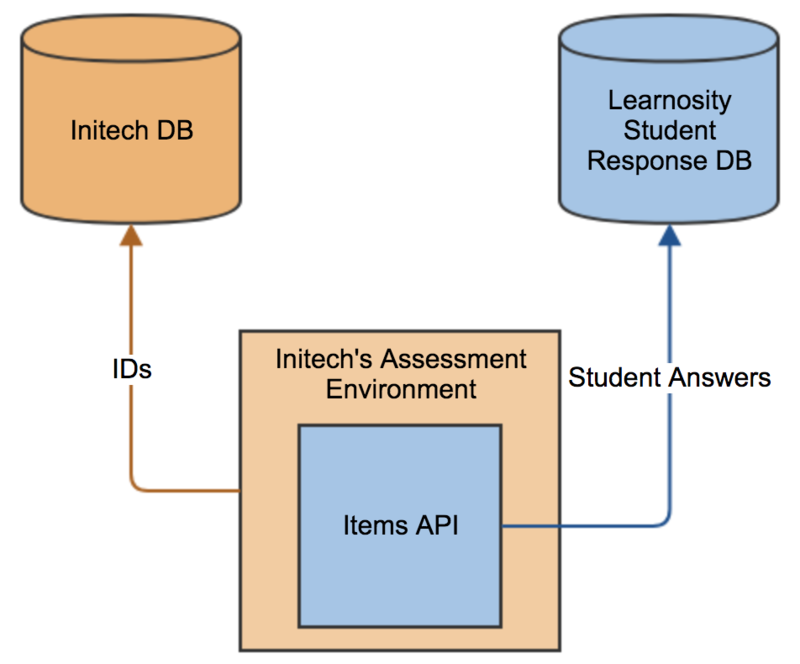 Figure 10: the Initech database provides user IDs, and the Learnosity student response database provides the report data. Initech now can choose from a multitude of different reports to display to the user — from seeing a review of every Question, to an overview of all the students in a classroom. Figure 11: logical architecture diagram for Initech's assessment solution. By using this workflow, Initech was able to allow their authors to create 65 different Question types, deliver tests to millions of students, and get detailed reporting — all without the user ever having to leave their environment. The only thing Initech had to store on their side was a handful of references and IDs.